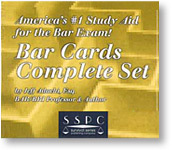 #1 in legal test preparation nationwide! The exciting new series of books containing the tools, techniques and 10 strategies that will guarantee your success in law school and on the Bar Exam... all in a fun and easy to understand format! 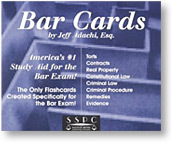 Guarantee your success on the Bar Exam! The Secrets to Scoring High on the MBE! Guarantee your success in law school and your career! New Edition! Includes "Agency and Partnership." 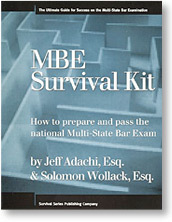 Our series of books apply top learning strategies to law school exam and Bar Exam preparation. 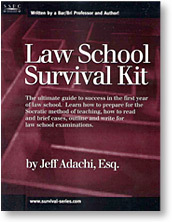 Other outlines tell you what the law is; the Survival Series shows you what to write. 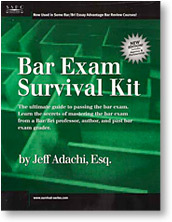 The Survival Series is authored by former Bar Exam grader and question writer, Jeff Adachi. 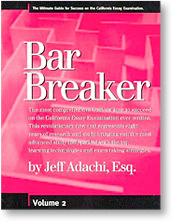 Adachi is a professor for BARBRI Bar review and is the author of BARBRI's California Essay Practice Workbook. He also teaches a bar review course which focuses on essay writing. More information about this course, adachibar.com. Over the last two decades, Adachi has successfully taught his strategies to thousands of students. Many of his classes have exceeded state and national passing averages.